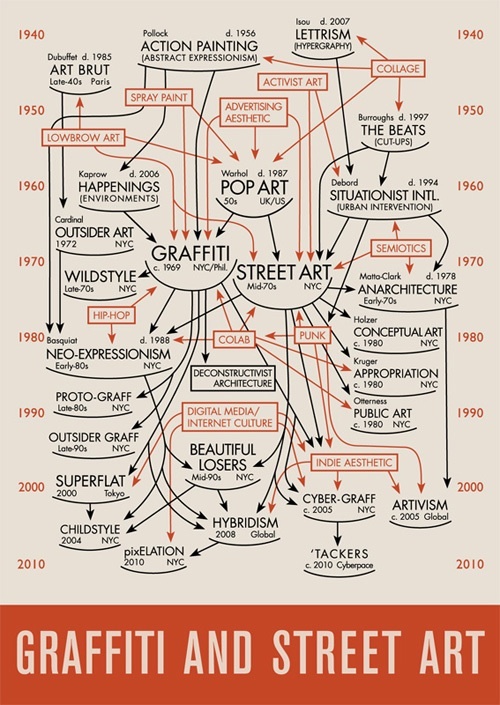 GRAFFITI & STREET ART diagram by Daniel Feral is a 75th Anniversary celebration of Alfred H. Barr's CUBISM & ABSTRACT ART diagram. 33 graffiti writers and street artists will unite to reclaim the former Donnell Library as a repository of visual information on the growing world-wide phenomenon of street art. This exhibition celebrates the art historical timeline that is New York City’s own unique legacy. Read more about Pantheon NYC: A history of art from the streets of New York City and also check out Luna Park’s Pantheon set on Flickr. Previous Entry Sited in BK — Is this the ‘Bird Internet’ mentioned on last week’s episode of 30 Rock? New Images of the Week from Brooklyn Street Art. Daniel forgets the “GRAFF VIDEO” (since 2000s) on his diagram. Have a look on “http://graff.video.free.fr/”. This is a new practice. The graff is produced directly and continuously with the light as medium (and its various parameters: intensity, color, brightness). The mark of light on the recording gives the “graff video”. As you can read on “http://graff.video.free.fr/en/approach.htm” it seems to be closed to Total Art movement. Thanks for the post and the feedback – Mista Oh!